By Kate Mishkin The Virginian-Pilot Â© July 4, 2015	VIRGINIA BEACH Pouring rain, police sanctions and holiday traffic didn't stop the nearly 150 people who gathered in the Convention Center parking lot Friday night with their Confederate battle flags. One by one, large pickups steered into the lot, horns honking and flags waving out the windows. People wearing Confederate T-shirts jumped out and gathered in groups. More trucks poured in, sometimes five or six at a time. Some sat in truck beds playing acoustic guitars. Many chatted about their plans for the night. A girl tugged on her mom's T-shirt. "Mommy, look at that one!" she said, pointing at a flag hanging out a window. Many who attended Friday's gathering said celebrating the flag meant celebrating history and heritage, not racism. 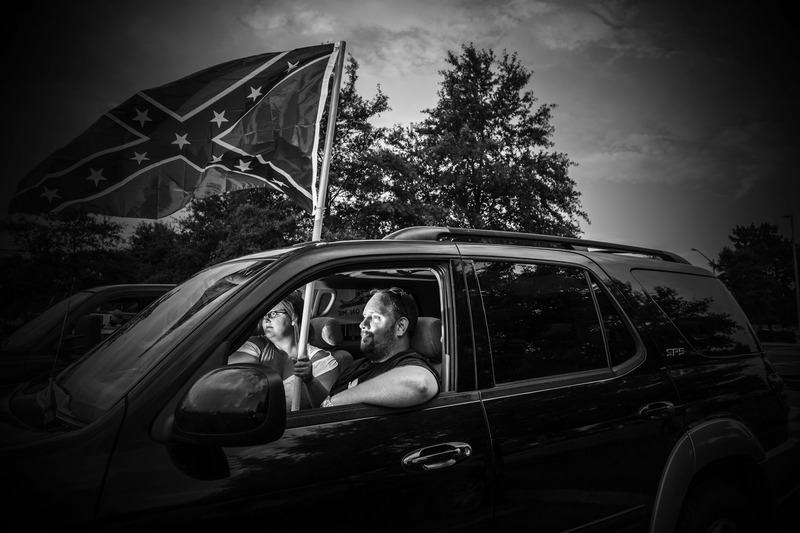 "The hate's coming from not knowing the history of the flag," Stephanie Mizelle said. She said that even when people respond negatively, she acts graciously. "We're not fighting back," she said. "I have black friends who run the flag. We're just flying the flag to show where we come from," said Robert Barber, who's from Georgia. He said many people who showed up heard about the event through Facebook and word of mouth. The same group held a similar gathering earlier in the week and plans to drive along the Oceanfront in August. On Friday, police told them to stick to a route around Interstate 264. "It's about our families and heritage, all of us. They lost people; we lost people. We lost family. It was all hard times," said Tina Lee. It's not about race, she said.